There have never been so many stories, or so many ways to tell them. We can tell stories in the pub, on television, in books, through games, on stage, over mobile phones, on twitter, in newspapers — any time, place or object that we can share with others can be the birthplace of a story…. This is surely the most exciting time in history to be in the story-telling business. I had a day off on Friday. Not to go on holiday or laze around or even to fulfill some chore. I took a day off to sit in a conference hall with some 100 other people to just listen to stories. I’ve said before that learning from your peers is the best way to improve, and indeed to be inspired. That’s why I signed up for The Story. Sometimes the best way to improve your work is to learn from other fields, particularly those perceived to be much more ‘creative’ than your own. As I shuffled into the quaint wooden confines of Conway Hall I really didn’t know what to expect. There was an eclectic mix of people, and many men with beards and glasses. I knew it was an event about stories and the art of storytelling, but what form would this take? Part of me expected a discussion of narrative theory and lively Q&As between a diverse range of people from different backgrounds. Wrong on all accounts. Cory Doctorow, blogger, author, journalist, internet legend, stepped up to give the first presentation of the day. The room was abuzz, applause sounded out. What would he talk about? Blogging? Journalism? Web 2.0? Cory said hello in his relaxed Canadian tone… and just read. He read a story, fiction, about books, about bookselling, about stories. So far, so unexpected. The Story is designed to try and bring some of that visceral pleasure back into your own work. The speakers will not talk about business models, technology platforms or government policy. They have been given a simple brief — either tell a story, or talk about what it feels like to tell a story… The aim is to get you to tell more stories — to be challenge, excited and inspired by the stories you’ll hear today, and to spread this amongst the people you tell stories with. (In hindsight, yes, I should have engaged more with what I was paying money for, but it’s nice to be pleasantly surprised). Tim Etchells stood up to tell three stories with the same dry delivery. The last one, in his own words, “barely qualifies as a story”, a string of celebrity names and descriptions of acts ranging from the mundane to the scandalous (all fictional — or are they?). It was all about the details, the clear, crisp adjectives, and our brain’s capacity to instantly recognise the names of dozens of people we know only through screens and print. After a much needed caffeine break, the charmingly nervous Sydney Padua — the girl with possibly the best name ever — came to talk about storytelling in comics. She disarmed everyone with a couple of humorous graphs, before apologising for discussing the ‘theory’ they had been asked not to focus on. Pushing up her glasses, she explained the planning, sorting, organising of information and ideas — mostly in graphic form — that leads to a story in her comic Lovelace and Babbage, itself a fictional take on the story of two historical (science) figures. She also admitted to ‘borrowing’ the story of Orpheus for their latest adventure, introducing to the day the familiar writers device of ‘building on what has gone before’ (after all, if it works, why not?). That theme was carried on by Tony White, a former writer-in-residence at the Science Museum, who talked about ‘remixing’ the words of different sources to make a new story. And in the spirit of organic narrative, Annette Mees and Tassos Stevens from Coney spoke of the interactive narratives of their plays, which feature no actors and rely on the audience to play the parts, taking ownership of the story and effectively co-authoring the work. It’s “adventure-making” according to Mees and Stevens, reflecting real-life, broken and messy and full of regret. But the key aspect is creating ‘flow’, the mental state in which you lose yourself in an activity. “The best designed play will make flow” said Stevens, which pretty much applies to storytelling in any medium. The play they discussed, A Small Town Anywhere, I’d heard of previously after a few friends of mine took part. Speakers I’d never heard of talked about the thinking behind stuff I’d heard plenty about through friends, in and on practically everything I consume — comics, science, words, books, theatre. Next up: games, specifically Echo Bazaar, a web-based, ‘you can play it for just 10 minutes at a time’ game that a friend has been eulogising to me about for some time. My take home message of Fail Better Games‘ talk? ‘Interactive casual narratives’ with multiple players over social networks that still have to make sense to everyone playing at their own pace are a nightmare to organise. The organisers threw free chocolate at the audience. Nom nom nom. Then the real pleasure, Tim Wright with perhaps the best story of the day, a diary-driven account of a prank taken very very far. The story, complete with the fake letters and other props used in the prank were printed in the conference newspaper, but interestingly that version didn’t include the parts about the breakdown of his relationship that added a bittersweet and quite different spin on the story. Were these real or embellishments for the performance? Was any of it true? I don’t know Tim, so I really can’t say. The mystery is part of the narrative I guess. Kat Akingbale talked about how the power of stories can be misused, particularly by quacks cashing in on people’s fears and beliefs for profit. Her’s was a standard talk, but distinguished from the others by the ghost photos, serious subject matter and her use of phone a friend (via mobile and mic) to explain the psychology behind why some people buy into paranormal stories. (I did think though, that her use of ‘call the expert’ was perhaps a form of audience manipulation itself?). Manipulation, the type employed by Kat’s sometime colleague Derren Brown, was also in in order for Stuart Nolan, who did a magic trick, after manipulating the audience into the right result. No slides, no projector, just pure audience participation, one man and a chair. “Making choices is how we understand peoples’ character,” he said. How we make people make the choices we want reveals something else. The best storytellers often realise that the best stories are sometimes not their own. Such were the words of Sam Conniff from Livity, a youth-led media agency, who told the tale of Jody McIntyre, a wheelchair-bound rap-inspired teen from the South-side for whom nothing was impossible. He climbed Machu Picchu, he went to live in Gaza. 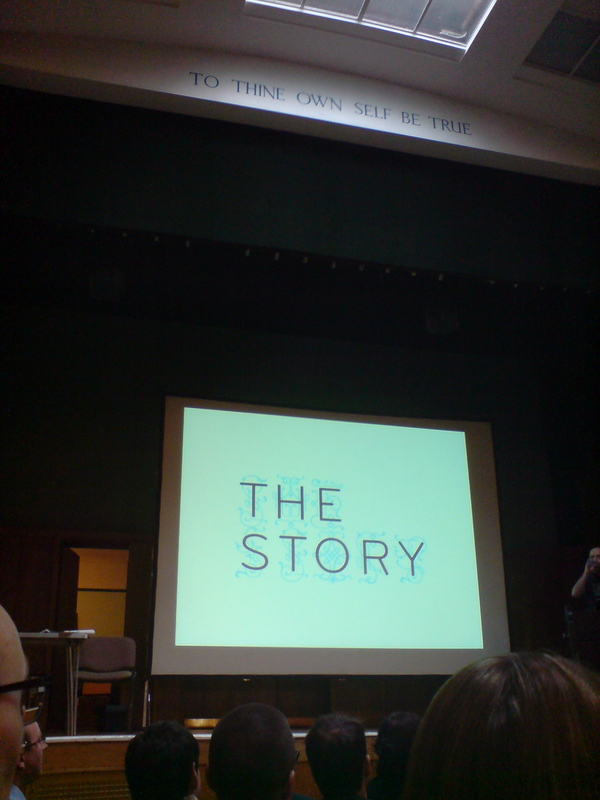 The power of true-life stories is also a theme of David Hepworth‘s monthly storytelling event. Six people gather round a table at an Islington pub, each telling a 12 minute story, a true story about themselves, no notes, no slides. David told one of his first stories, about fine tailored suits and his Dad, and with a traditional story ending: a moral to the tale. The moral of his story was ‘Dad, you were right’. The moral to my day was: ‘Matt Locke, you were right’. There are an awful lot of stories out there, and I can’t wait to tell my own. There are plenty of other people’s thoughts, videos, photos etc. on the event out there on the web. Search #thestory on twitter. We’ve also been promised podcasts of all the sessions at some point in the near future, so keep an eye on The Story website. I was jealous reading the tweets come through on friday. Now I’m VERY jealous 🙂 Sounds like a fab day. Thanks for writing it up, the links are useful!